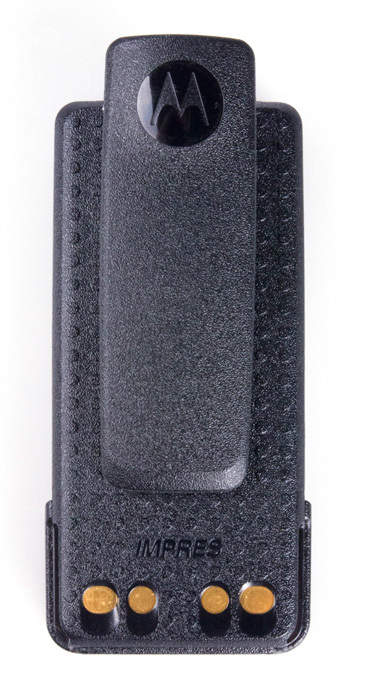 The intelligent 7.4-volt lithium-ion battery for the Motorola DP4600. Those who use radios for long periods – shift workers are a prime example – need batteries they can rely on. DP4000-series devices (for example Motorola DP4400)automatically let you know when their batteries need replacing, and it’s really easy to exchange the DP4600’s battery for a spare, even with thick gloves on. Our Radio-Rental.com team tests every battery you order then charges each one to 100% of capacity before delivery. Of course, batteries will still need to be recharged after long periods of use, but these batteries have built-in protective electronics, so overcharging and surges pose absolutely no threat...regardless of how long the batteries are connected to the charger. We'll be happy to customise a quote for the Motorola DP4600 (battery included), plus a spare DP4600 battery. You can contact us via e-mail (mail@Radio-Rental.com) or at our toll-free phone number (0800.11.88.44.0). Tip: You can find headsets for the Motorola DP4600 here: Headsets. We at Radio-Rental.com look forward to hearing from you!